The espresso ganache-based Obama chocolates that Cosmic Chocolates pours out in Oakland as part of their "Cosmic Icon" collection is old news in the Bay Area. Tasty, but old. Therefore, our Bay Area political chocolatieres should step up their game because Boston-based Burdick's is seriously outclassing them. Check out Burdick's separate Obama and McCain chocolate boxes. 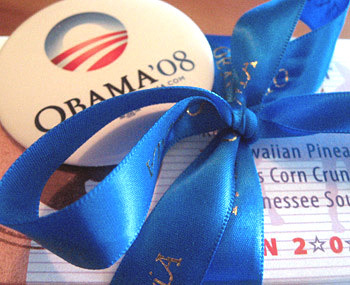 Not only do you get a jean jacket-ready button touting either campaign and a festive box tied with blue or red ribbon and bearing the party's animal, but each box of chocolates is flavored in line with the individual candidate's history. 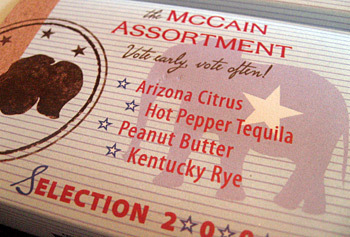 For example, the McCain box features an "Arizona Citrus" chocolate and a "Hot Pepper Tequila" chocolate. Separately, they are sort of a mystery -- when I think of citrus, my mind does not jump to AZ -- but together maybe they make sense. Sort of a chocolate cocktail. Try shoving both in your mouth at once and see if I'm right. Also confusing in the McCain box is the "Kentucky Rye" chocolate, described as "dark ganache with a strong rye whiskey, seasoned with citrus." Huh? I guess it could just be one of their signature chocolates, along with the tiny chocolate mice and Kentucky Truffles also included in the assortment, but wouldn't it have made more sense to developed a beer-flavored chocolate? I grew up in a house divided, so for my parents' anniversary (September 11th, no less), I sent them boxes from each party. My Dad's a definite Republican, and while my mother has always been a liberal, I'm never 100% certain which way she'll go. She might see this as a bribe. I wrote, "Happy Anniversary to a couple who have always remained strong individuals even after 40+ years." So, if you're undecided about which way to go in November, buy a 1/4 pound of each and let your tastebuds decide, because unlike the actual political parties, neither of these will leave a bad taste in your mouth. Can't you just see Stephen Colbert chewing these over, trying to determine which one tastes "more presidential"? Another food purveyor tempting the nation's political palate is Northbrook, Illinois deli, Max and Benny's. They've baked and frosted cookies in the likenesses of Obama, McCain, and Biden. I'm not so sure I'd want to eat a McCain, though; check out the expression on his face! It's got indigestion written all over it. Also, one of my favorite beer companies from back east, Magic Hat Brewing, has tricked out their 12-packs in all sorts of vote-happy colors and images as part of their get out the vote campaign with Head Count.